Immergiti nel passato del Messico alle rovine Maya di San Gervasio, un sito archeologico a Cozumel. Una guida professionale ti porta in un tour informativo oltre le strutture antiche e condivide la visione di questa civiltà. Poi goditi la bellezza del Mar dei Caraibi dalle rive sabbiose di un beach club dell'isola. Questo tour di mezza giornata parte la mattina o il pomeriggio e include il pranzo e l'uso dell'attrezzatura per lo snorkeling. We had a wonderful experience on this excursion. We were picked up by a private taxi and taken to the ruins where we had a private guide who patiently explained about the Mayan people. We then went to a Tequila factory where the fine points of the tequila process were explained followed by tasting. We then were taken to a beach area where our meal was provided. We had a very enjoyable driver and an enjoyable excursion. Alberto took good care of us to ensure we had a fantastic time and that we felt safe the entire time. He shared with us the island’s history throughout the tour and we got to know him personally. He was very accommodating and courteous. Everyone that we encountered on the island were very friendly. the ruins were wonderful and the driver we got was awesome full of knowledge. my disappointment came after the ruins, the lunch was just ok. and the beach time was horrible. We were taken to a kid friendly beach. They had a ton of things to do in the water. I can see why they called it a kid beach but we had to enter into a house that a ton of drivers were just hanging out at waiting for there guest. It looked like it use to be a really nice beach house but was abandoned or sold and they just set up shop in it. they one bathroom for ladies was occupied so they said we could go upstairs to a bedroom to change. it was scary and smelled like urine. We stayed about 10 mins and asked to leave and go back to the boat. Well...we couldn't pronounce our guide's name without sounding stupid so he told us to call him Taz. He had a cooler full of water, soda, and beer and delighted us with his knowledge of the area and tales of current events and stories from his own family. We were nightmare tourists... four kids under five in our group... and not one person was anything but kind and helpful throughout this tour. We stopped at Mayan ruins which were super cool to see. We had a knowledgeable guide and learned many things. Next we stopped at a Tequilla distillery... fun, good tequila, and even the kids had a good time. Our final stop was a beach stop. Because we had the kids our guide took us to a more family friendly beach resort where we had great food, hung out in hammocks, and got massages. The snorkeling part didn't happen because of our change of venue with the beach, but this was our choice. The guide was great... the kids were free... nothing was rushed, we took our time and had a great time at a great price. Do this tour... I rarely write reviews but I felt compelled to tell you this one was a great one! 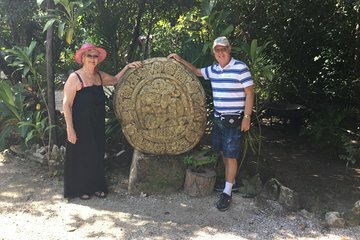 We were looking for an excursion to Mayan ruins that would not take an entire day of our Mexican vacation! This trip was four hours and was fantastic! Our tour guide, Taz, was charming, funny and very accommodating! Great trip! !